Median coverage levels are shown for selected WHO Commission for Information and Accountability indicators of intervention coverage for Countdown countries with data for the period from 2007 through 2012. Vertical bars indicate the range of coverage estimates across the 75 countries with available data. From: Bhutta, ZA and Black RE. 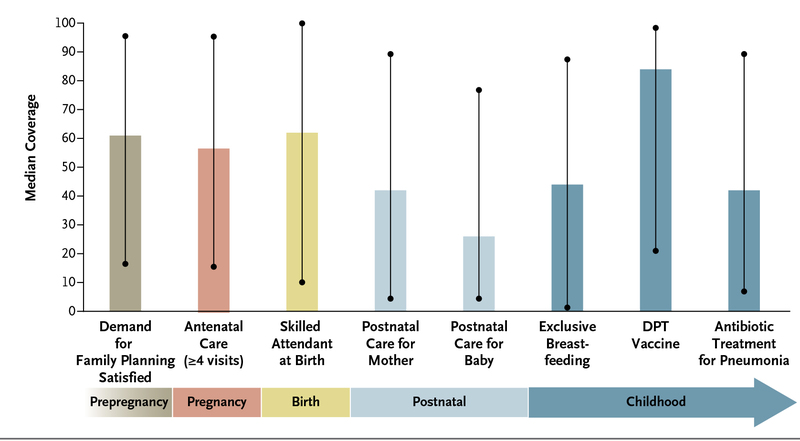 Global Maternal, Newborn, and Child Health — So Near and Yet So Far. N Engl J Med 2013;369:2226-35. School of Public Health, and Zulfiqar A. Bhutta, MB, BS, PhD, Sick Kids Center for Global Child Health and Aga Khan University, report in the New England Journal of Medicine on how to achieve rapid decreases in maternal, child and newborn mortality by 2020. While childhood mortality has fallen to around 6.5 million from over 12.5 million in 1990, major disparities remain—with both urban and rural poor communities shouldering crushing levels of maternal, child and newborn mortality. In addition, the authors report on data suggesting that most Countdown Countries (the 75 countries with more than 98 percent of the current burden of maternal and child mortality) are not on target to meet the Millennium Development Goals for reducing maternal and child mortality by 2015. Despite global recognition that key essential evidence-based interventions should be implemented and scaled up within health systems, major gaps remain. The graph here shows the current median coverage of key interventions across the major Countdown countries and highlights the wide disparities in coverage. Using the Lives Saved Tool, Bhutta and Black estimate the effect of scaling up coverage of proven packages for maternal preventive care and child care, for newborn resuscitation and care, and packages related to community-based case detection and management. These reliable estimates show that at 90% coverage, millions of deaths could be averted by 2020. Evidence also suggests it is possible to reduce the mortality among the poorest and marginalized sections of the population and to accomplish this reduction rapidly. Moreover, recent surveys have also shown that such interventions generally favor these disadvantaged populations and help narrow inequalities. To view estimates of the lives saved and descriptions of intervention packages, see the complete article in the New England Journal of Medicine. Citation: Bhutta, ZA and Black RE. Global Maternal, Newborn, and Child Health — So Near and Yet So Far. N Engl J Med 2013;369:2226-35.